This construction sub-contract is for a builder to buy and use for any small works project. Suitable for a deal with a one man sub-contractor or a large company providing a specialised service. Makes clear the self employed status of the sub-contractor if a sole trader. Allows you to define the work to be done and make sure it gets done. Takes some of the risk out of using an unknown tradesman. Contains many other provisions useful in a contract of this type. Comes with extensive notes explaining every item. This construction sub-contract is for a builder to buy and use. It is a basic straight forward construction sub-contract for any small works project. Use to contract with sole trader or company. Suitable for a deal with a one man sub-contractor or a large company providing a specialised service. Makes clear the self employed status of the sub-contractor if a sole trader. Allows you to define the work to be done and make sure it gets done. Takes some of the risk out of using an unknown tradesman. Many useful provisions. The construction sub-contract requires that you attach a specification of work. 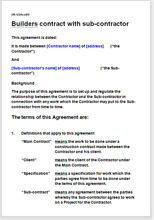 If you use the same sub-contractor for other projects in future, he will automatically be subject to this agreement. Comes with extensive notes explaining every item and leaving you simply to choose and use. This construction sub-contract covers just those areas where you most need legal strength: limiting your liability if things go wrong, payment provisions, the specification, no posting bad publicity on social networks. Of course, with the wide Net Lawman experience of the real World, there are yet more helpful points too. This construction sub-contract also contains drafting notes to make quite clear what the text means and to advise you on choosing from the options we give.